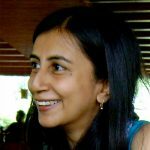 Anjum Hasan is the author of the novels The Cosmopolitans, Neti, Neti and Lunatic in my Head, the short story collection Difficult Pleasures, and Street on the Hill, a book of poems. Her books have been nominated for various awards including the DSC Prize for South Asian Literature, the Hindu Best Fiction Award and the Crossword Fiction Award. Her new collection of stories, A Day in the Life, is forthcoming from Penguin India.